Celebrating the life of the legendary musician, Raymond Weil pays homage to Bowie's legacy with this limited edition watch. The dial shows a radial brush texture that resembles the cover of a vinyl and features the iconic lightning emblem Bowie used in his album covers and on stage. His famous pop-art logo that was designed by Andy Warhol is marked near the centre and 1974 portrait of Bowie himself has been placed on the back of the watch. The watch is protected with scratch resistance sapphire crystal and anti-glare coating, and is powered by Swiss-made automatic movement with up to 100m of water resistance. With only 3,000 pieces created, this is a special opportunity to own a piece that tributes the life of a musical and artistic legend. 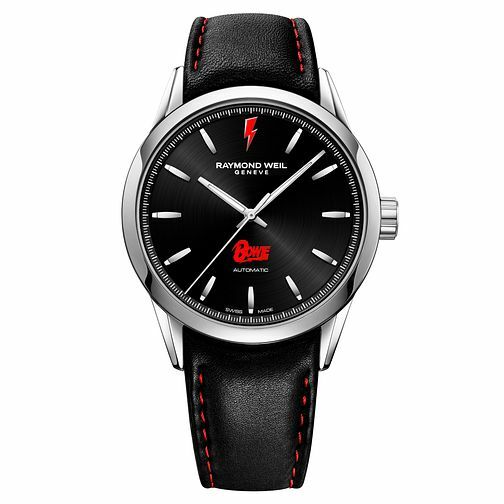 Raymond Weil Limited Edition Freelancer Bowie Strap Watch is rated 5.0 out of 5 by 3.